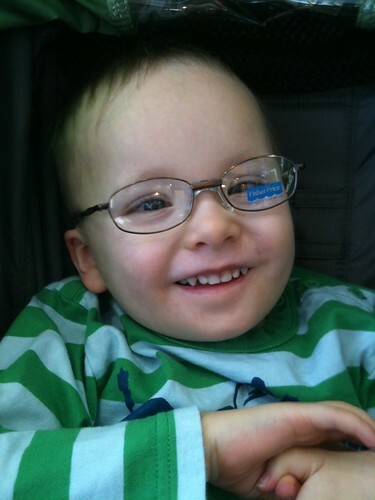 At age 3, Joe is wearing the same frames we got him when he was just 6 months old. They’ve been adjusted a time or two to fit his growing noggin, but never replaced. That’s kind of miraculous, especially since they aren’t the super-indestructible kind that we first looked at. We went with the second pair, which (except for the size and the nose pads) is pretty much the same as what he has. We did the same thing when we replaced Sam’s — ended up with very similar lavender miraflex. They’d just become so much of who she is to us, there was nothing else as perfect! Does Joe wear a strap around his head? We did get a back-up pair for Sam that’s a little more grown-up (e.g. not the miraflex) but they don’t have a strap and she seems to hate them and just takes them off when we try them on her. Joe is a stud, but you know that already! He’s too cute! 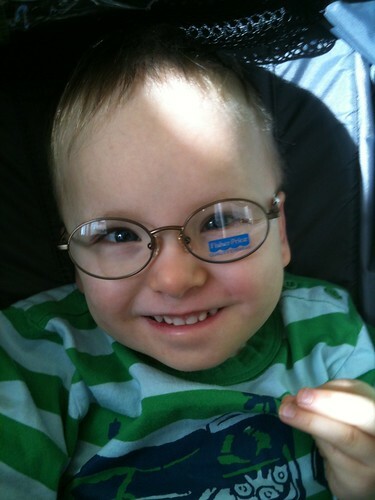 My son has pretty much always worn glasses too. Right not they are not in service (broken).